During the 23 cm NAC I discovered that Airscout was not showing any planes anymore. On ON4KST I saw several other who found the same problem. but then found that this was also not working. I tried to find the SM7LCB tool elsewhere but did not find it. Fortunately I had it stored on my local hard disk. The Airscout programm from DL2ALF is working again after a version update. Thanks very much Frank DL2ALF for your effort. is the best way to make nice DX contacts on 23 cm. a distance of 729 km, which for many 2m station is not possible or a very beautiful DX contact. at that time the aircraft flew exactly through the scatter area but there was also good tropo propagation. not arriving at the aircraft. During the other contests I succeed contacts at 23cm often at greater distances. JN89ak about 854 km or with OK1KUO JO80ff about 849 km. During the VERON Dag voor de radio amateur I had a live demo in the VHF-cie stand to demonstrate aircraft scatter. times saw an increase of the signal with more than 20 dB. scatter area you will then hear the signal of your counterpart rise and usually a minute or two at usable strength to make a QSO. Requirements to be able to work with aircraft scatter. with the skills to complete a QSO within 30 to 60 seconds. Depending on the flight path of the airplane a QSO sometimes must be realized in only 30 seconds. If the flight path is better than there is more time, up to more than four minutes. Using your own position and the position of the dx station the scatter point can be calculated. 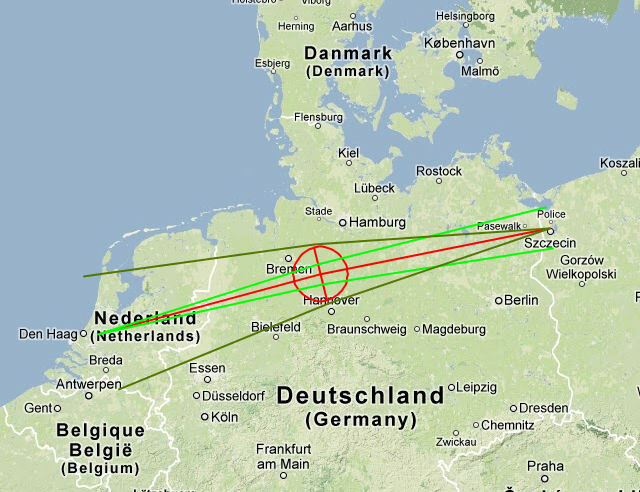 This can be done using a tool built by SM7LCB, available on the Internet. opening angle of the two different antennas. In the figure, you see the common scatter point between me and GM4CXM. Now it is important to know where the aircraft fly, to determine at what moment the QSO is possible. arbitrarily choosing a on-line radar website, because most websites are delayed, for safety and sometimes are fifteen minutes behind. That kind of radar is obviously of no use, because using a delayed radar you can only see that you could have been able to make a QSO fifteen minutes ago. your DX station is QRV and at the right time and frequency transmitting or listening. You agree with each other who at what time and at what frequency will transmit and who is going to listen. With GM4CXM most of the times he gives CQ in CW and I respond as soon as I can copy his signals. This works fine for the tests we have done up to now. you can then quickly make the QSO through reports and locator exchange and finally confirm everything with Rogers and 73's. The fastest QSO what I made in this way is within twenty seconds. I sometimes copy GM4CXM four minutes and can still hear him calling CQ. but if you look in the scatter maps the area were the reflection arrives is not that big. and the reflection from the plane which I use to make a QSO will not work for the other station. Each amateur must make a calculation, for its own situation, of the scatter area. 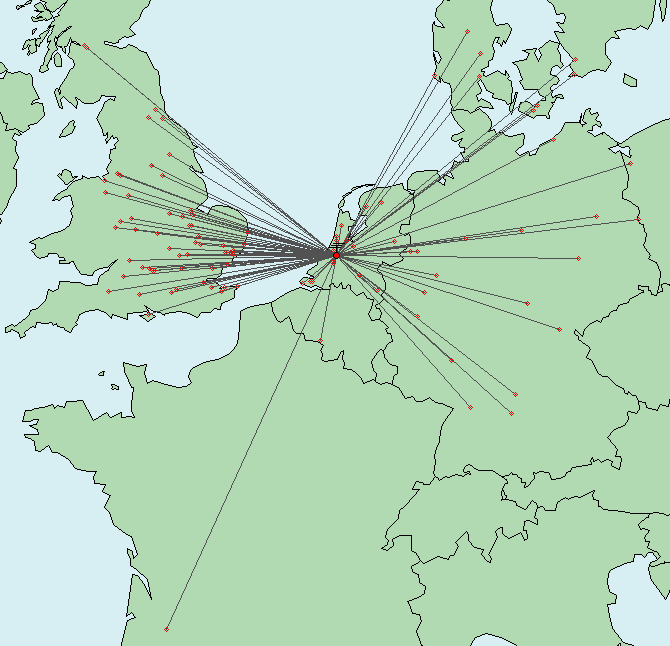 For stations that are within 30 km it should be possible using the same scatter area to make a QSO a connection to the DX station. However both stations should be working fast, because the reflection often is short. and on the end his SSB signal comes in calling CQ contest. flying through the scatter point at more than 11km altitude. The picture is made just after the QSO with GM4CXM. After my first article I started to better understand aircraft scatter and try to make QSO's with more stations. One problem that I had trouble was that the scatter area was not simultaneously on the radar map. by making the upper map transparent. With this tool it is much more clear how aircraft in fly the vicinity of a scatter area. After installing it needs some time to figure out how things work, but that is reasonably fast to understand. Now put the map with the calculated scatter area below the map of the aircraft radar and be sure that both maps have the same scale. If all that matches you can click the icon GridVista (almost top right of your screen) click on the button transparent. moving the map until it fits exactly above the map with the scatter area. To align you can use coastlines, or sometimes place names, which often are placed on same way in the two maps. It is a bit trying, but the result is a picture in which you see the scatter area and the positions of the aircraft. In this figure you see a preview. After I projected both maps over each other, I was interested why for some stations I needed to plan a QSO and why for some other stations this was not or hardly necessary. - sometimes stronger then a bit less - . The scatter area needed for that QSO is	located in an busy airway most of the time there were usually two or more aircraft flying in the scatter area. and plan a QSO and keep a look on aircrafts approaching the scatter area. For example the scatter area for my QSO with GM4CXM has about three flights in the evening when the DAC contest is held. If you will miss these planes the chance of making a QSO is lost. Once accustomed to this practice, how airplanes fly and which flights are suitable, it is not very difficult. So now I know that very often the KL49J crosses very well the scatter area. the flight approaches the scatter area. Ten minutes before the flight enters the scatter area I chat with GM4CXM using the ON4KST chat box to warn the him to be alert for the upcoming possibility. Then it's most of the times pretty simple to make the QSO, in which more than 90% of the cases we tried actually succeed. With SP1JNY from JO73gl a distance of 686 km, I have made 3 times a planned aircraft scatter test so far which all were successful. The first time I experienced a QSO with SP1JNY as very special, because I still remember that my first QSO with SP is not that long ago needing good tropo propagation. 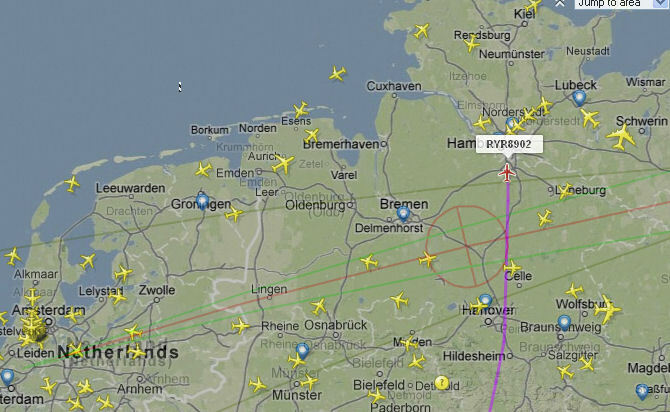 In Figure 4 shows how the plane flew, and which route it has followed some time after I the connection was made. The diameter of the scatter area is user set. In this picture you can see the plane actually flying just on the edge of the area. My impression is that as the distance between the two stations is larger also the diameter of the scatter area becomes larger. Also I made several QSO's with GM0USI from IO75uv about 722 km, using planned aircraft scatter. because I was not trying to find if an aircraft was flying in the scatter area. 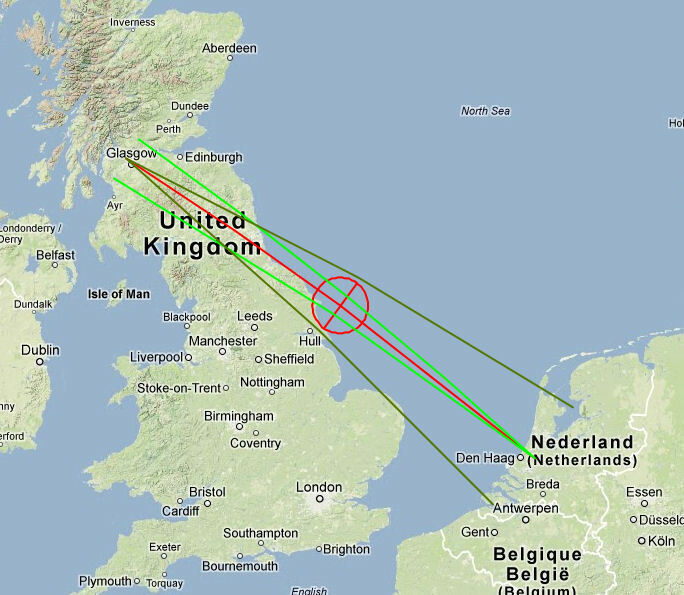 So the contacts I made with OK5Z from JN89ak about 854 km were made with great certainty using aircraft scatter. The last few months I have been trying to test with IZ4BER with if we can make an aircraft scatter QSO. In the tree times in which we now tested we have not been able to succeed. Perhaps this distance is just too far. It is obvious that a large part of the real DX contacts on 23cm is made with help of aircraft scatter. The signals are usually not very strong, but success rate is very high. and more than 100 watts output. With a free take off this allows DX contacts over 800 km reasonably reliable. then the maximum distance of the DX will be more, because he can have line of sight contact with a plane over a much larger distance. 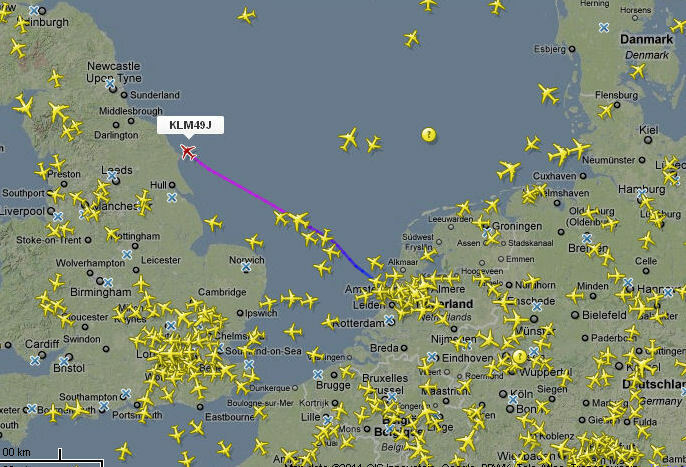 An airplane flying on an altitude of more than 10 km is visible over a range of about 400 km away. 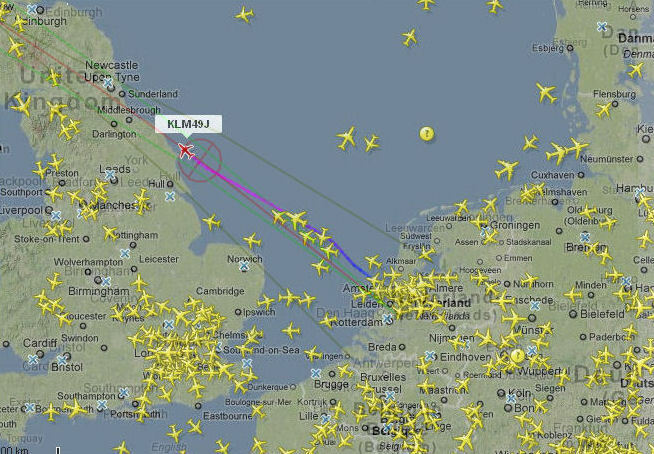 If both stations have a free take of to the horizon and be able to see the aircraft on a large distance a DX of more than 800 km is possible. When one is on a high mountain then he could see the plane even a 100 km further and the we can make the 900 km range. Distances of 1000 km are not realized using aircraft scatter. Doppler shift. When we calculate the scatter area we always see that its located exactly halfway the distance. If an RF signal is blasted on the aircraft the reflected signal will have a Doppler shift in accordance with the speed of the aircraft. The RX station than receives the shifted signal but this signal is shifted back just on the same amount as the signal shift on the aircraft. During scattering we are dealing with two Doppler shifts, from the transmitter to the aircraft and from the aircraft to the receiver. plane to the receiver. Because the two shifts are opposite the net Doppler shift is zero. the frequency starts to drift away. But in addition, the signal strength is usually much less than that the middle of the scatter area and a contact is no longer possible. Occasionally you can indeed hear signals that encounter Doppler shift, but usually this is very short and useless. because the earth comes in between. As the airplane is flying higher the bigger distances can be reached. On the radar internet site you can select a height filter. For distances up to 500 km I usually set the height filter so that I don't see aircraft flying below 7 km altitude. For distances above 700 km I set the filter so that I only see aircraft flying at an altitude of more than 10 km. In the November 2012 DAC I made a test with GM0USI. We tested using an Boeing 747 flying well in the scatter area at an altitude of 9 km height, but that test failed. Shortly thereafter a Boeing 737 entered the scatter area at 11 km altitude, and then we were successful in our QSO. airplane must be flying above 10 km altitude. Also on the other bands, both above and below 23cm, its possible to make aircraft scatter contacts. the distances are generally less than at 23cm. Distances up to 600 km at 10 GHz are certainly possible. On the website of SM6FHZ I found an Excel spreadsheet to calculate the signal strengths which is helpful in understanding what to expect. The station parameters data from the two stations as antenna gain, output power, and so on must be entered. Based on radar equations the spreadsheet calculates how strong the signals can be. I have been playing with this tool and come to the conclusion that this calculation gives a good impression. A possible explanation could be that the radar equation is based on back scatter, whereas we are scattering forward. The determination by the spreadsheet of the reflecting surface of the aircraft may be an other source for the difference. Nevertheless, the spreadsheet gives a good impression what is possible. you need to see the aircraft without obstacles between. 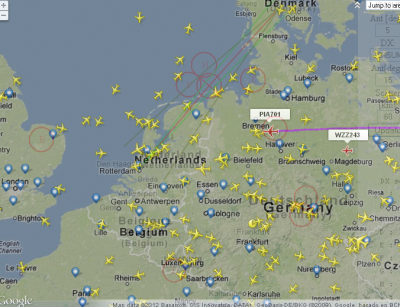 to see if aircrafts are approaching interesting scatter area's. I use the again the above-described radar and the tool from SM7LCB, but now for a much larger area. and this will then project the scatter areas for these stations. Then I put the aircraft radar in the same scale above and I make the radar display transparent. Provide the same scale of the maps and both maps neatly aligned you see all flights and scatter areas. quickly using ON4KST make a sked request to the related DX station and agree on timing and frequency. Than it is a matter of good operating technique and listening to be able to make a QSO. The mechanism aircraft scatter is very interesting to use and one can further investigate using this technique. higher frequencies sometimes even better than on the two meter band. It is interesting to further investigate and study the size of the scatter area. As stated above, I think that the area is smaller when the DX distance is smaller. It is also interesting to examine how the scatter area must be defined for the higher frequencies. aircraft such as the Boeing 747 or the modern Dreamliner. It is fortunate that the passengers in the aircraft do not know we use their plane to realize a DX contact. This tool shows directly the planes in the map with the scatterpoint prediction and works more easily than the combined picture as described above. After using this tool I have good experience as long as you only use aircraft within an area of 30 to 40 km to the midpoint. Although this tool is easy to use I sometimes miss airplanes in this tool which are visible in the flightradar24 picture. Also with this tool it's not possible to take an overview and guard a large area with different scatter area's. So with this tool you have to choose the qso partner before you can see the scatterpoint and aircraft around it. Each tool has it's own advantages and disadvantages. I have been working with Airscout for a few times and I would recommend this for operators with little computer experience. to have an overview of all your dx stations and their scatter areas.